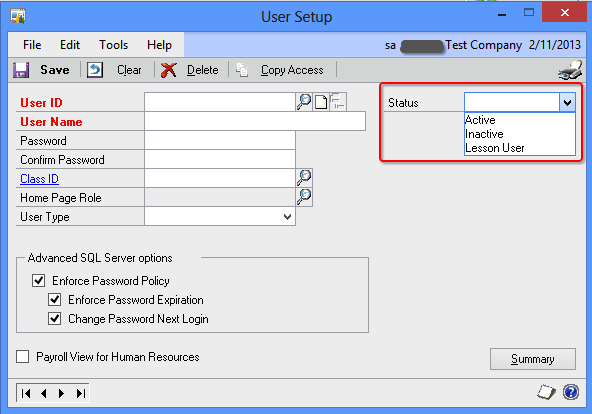 You can now inactivate a user in Dynamics GP 2013 temporarily. This is a feature addition to User Management in GP. There is a new field called *Status* which is a Dropdown List. Contains 3 statuses namely, Active, Inactive & Lesson User. When a user status is set to Inactive, that user cannot log on to GP but will retain his/her access when activated again. We can still manage access information of an inactive user. Upon his/her next login, the modified access information will get into effect. When a user status is set to Lesson User, that user can access ONLY Fabrikam Inc. (sample company). This entry was posted in GP 2013, GP Administration, GP Functionality, GP2013, Microsoft Dynamics GP 2013. Bookmark the permalink.